First a confession - I realised I don't own any knitting books other than a fairly basic one which I was given years ago. I have lots of pattern books, some Harmony Stitch Guides, but not anything really helpful. I tend to rely on the internet or Ravelry if I need to know something. Maybe I should put a good book on my Christmas/Birthday list - suggestions would be welcomed. I'm more than happy with my general knitting thus far. I cable, fairisle, simple lace, some intarsia, though I prefer stranding if I can get away with it. I think my work is acceptable, others might not. When checking out double knitting - I assumed we were talking ply!! I realised I had actually done some of this in the head construction of this little fellow, nothing to onerous there, so may give something else a try. Steeking - Oh my goodness, NO, I could not bring myself to take the scissors to something I'd just knitted, really can't see the point. I would like to do some more lacework. I'm sure I set myself this task last year. I did complete a Travelling Woman Shawl, which turned out ok, though maybe should have been blocked better. I have bought myself some proper blocking wires now, so at least I can do any new project justice. I have looked through Ravelry, found and added to my library some possibles. Spinning - plan to try this later in the year when we have a workshop at my knitting group so watch this space. 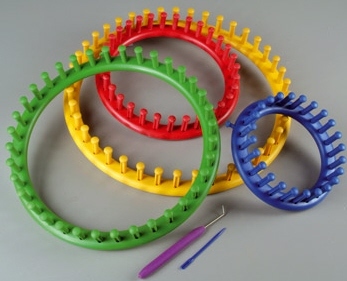 Loom knitting - I have a set of these and also a rectangular one. Had a little play but nothing serious, so something else to try out. Weaving - I have a small weaving frame - again played with it a bit but nothing produced yet. I bought it in the local charity shop, it came from Ikea originally so imagine it was possibly﻿ for children. Can't be that difficult to master then! and then there is Crochet - I have a real blind spot with this. I have been shown a few times, I get it, then if I don't keep at it, forget. Several ladies in my knitting group crochet so when I have nothing better to do I will try and crack it once and for all. So much to do - so little time....join the club! I have a shelf full of books - I just love Elizabeth Zimmerman! My faves are Knitting Workshop and The Knitters Almanac. Enjoy! Looks like you've got lots to try! You are such an accomplished knitter, look at all those skills that you are either great at or that you are in the process of learning! Wow! I love how you just shrug it off and put things on a list of "must remember to try that later"... your list of "already accomplished" items is beautiful so I can't wait to see the results of your new endeavors. Lovely work! I gave in and picked up crochet last year, and it finally stuck for me. Now I'm addicted to making washcloths, and my knitting projects are languishing. Oops! Will be interesting to see how your spinning adventure goes. I 'test drove' a few wheels recently. I like your shawl very much! Now, when I have a baby I don't have much time but I've got so many ideas! Days are too short...and I have to sleep a little, don't I? That list will be keeping you busy for a good while! The Principles of Knitting is a good resource about pretty much everything there is to know about knitting.